I really like the combination of sweet and salty. A lot. I love honey mustard, barbeque, sea salt caramel, and I even put a tablespoon or two of dark brown sugar in my chili. But I must say, my favorite combination of sweet and salty comes in the form of fruit and cheese. Apple and gruyere grilled cheese? Fig jam and brie on crackers? Strawberry and blue cheese salad? Come hither, my lovelies, and take your spot on my dinner plate. A few years ago I stumbled upon a pear soup recipe that intrigued me. 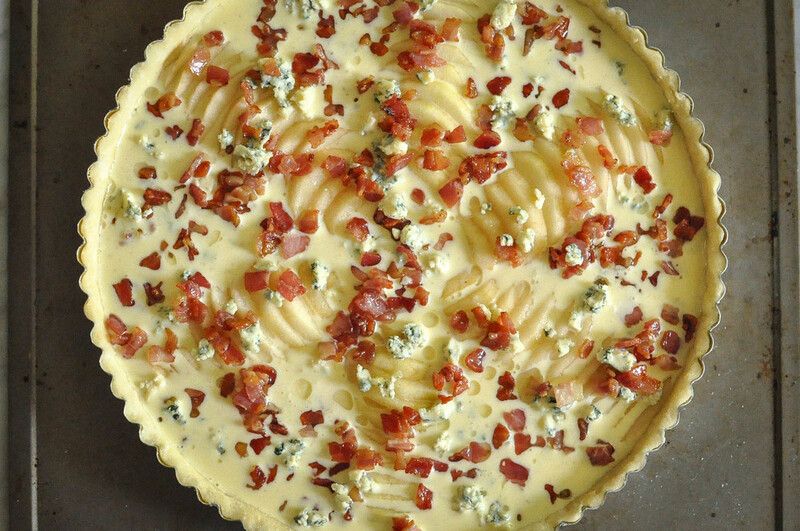 It was topped with blue cheese and pancetta for a salty contrast to the subtle sweetness of pears. It was wonderful, but almost too "healthy" (I have that in quotes because calling a recipe that contains cheese and bacon healthy seems a little odd) and my love of all things artery clogging directed me towards a tart inspired by all the flavors of that pear soup. It did not disappoint. But then again, I think everything tastes good with a pie crust. I'm already contemplating what I should make next. Perhaps a pot pie, or hand pies, or a sweet pie. Throw some suggestions at me if you have any! To test whether your pear is ripe enough but not overripe, pinch the necks gently and if it gives just ever so slightly, it's ready. My philosophy on par-baking: I almost never do it unless the filling takes much less time to cook through than the crust, or it's a graham cracker crust in which case you don't need foil and weights, so why not? Usually, it's too much of a pain for what I find to be little or no advantage. 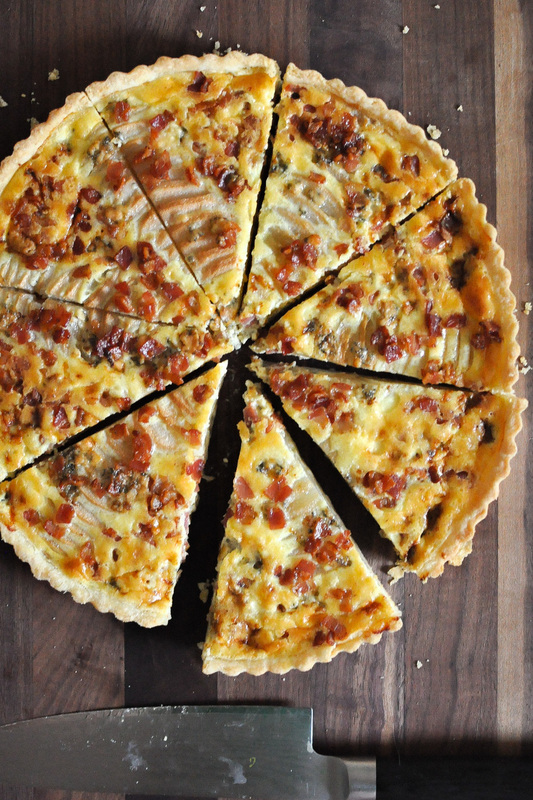 Savory tart fillings usually take a long time to cook through in the oven, giving the bottom crust a chance to become crispy and golden, as long as you bake on a lower oven rack. If you bake on the top rack of your oven chances are the top will burn before the bottom cooks through. To make the crust, combine flour and salt in a medium mixing bowl. Cut in butter with a pastry blender or two forks until the size of small peas. Add ice water a tablespoon at a time until dough just comes together. Wrap tightly in plastic wrap and chill in fridge for 30 minutes. Meanwhile, cook the pancetta in a medium stainless steel skillet over medium heat until crispy. Cook it to slightly under your desired doneness as it will finish off in the oven. Let cool and set aside. Place eggs, mascarpone, whole milk or half & half, nutmeg, and salt in a medium mixing bowl. Whisk to combine. Get a 10 or 11 inch tart pan ready. Removed dough from fridge, unwrap, and roll out until wide enough to cover the bottom and sides of your tart pan. Gently transfer to tart pan and press in. Clean up the sides by cutting off any excess dough using your fingers against the rim of the pan. Peel pears and cut two large pieces off from each side, leaving only a thin cross section containing the seeds leftover (I happily munched on this leftover section until nothing but seeds and stems remained). You should now have six pear halves. Scoop out any seeds if you cut a little too deep into the pear centers. Blot the tops and bottoms of each piece to remove excess moisture. Cut each piece crosswise into thin slices. Arrange each pear half in a flower petal pattern in the tart shell with the narrow end toward the center, fanning out the slices so they are slightly separated but still overlap. Drizzle the mascarpone custard filling around the pears. Sprinkle the pancetta and blue cheese crumbles on top. Place on the lowest rack of your oven and bake 40 to 45 minutes until golden on top. Let cool for 15 minutes before slicing.